Lavender deodorant container for whenever I got around to figuring out how to make my own. I did a few days ago, and I was surprised at how well it worked. Coconut oil (you can buy here– it’s fantastic to eat too!) I usually use expeller pressed in the deodorant, because I sure didn’t want to put expensive cold pressed organic coconut oil on my armpits. But coconut oil does have antimicrobial properties and is a solid oil, making it good for deodorant. Rosemary oil because I kept forgetting to order lavender essential order when I ordered anything from an online health food store, and I sure was not interested in paying the $7.99 it cost at our local health food store (online it’s about $3-4 for half an ounce). So I settled on rosemary essential oil at $3.79 for 1/3 of an ounce. Rosemary has a slightly medicinal smell, which works well in a deodorant. The only other oils I had at home were eucalyptus, orange, lemon, camphor, and tea tree, all which I thought would smell odd in my underarms. *Note: It’s said that Rosemary oil in excessive quantities may harm a pregnancy, so you need to make your own decision about this if you’re pregnant. I’m pretty sure that Lavender oil is generally considered safe, but please do your own research. I don’t really think that this is an excessive amount, but you want to research anyway and see what you’re comfortable with. I put about 3/4 a cup of baking soda in a bowl, melted about a tablespoon of coconut oil, and mixed the melted coconut oil and 30 drops of rosemary oil in until it was mixed through. I thought that by melting the coconut oil I’d get a firmer deoderant stick once it set up. Backed out the deoderant tube. Didn’t bother cleaning the dab of Tom’s left in the bottom, just left it there. Filled it with the baking soda mixture and tapped the bottom on the counter to get all the bubbles out. Let it sit over night to harden up, and it did. It’s soft still, so I just raised it up a little bit to use it and didn’t press hard. It worked really well for me, better than the Tom’s. I thought it might leave residue because it’s baking soda, especially on a dark shirt, but I didn’t notice any and I wore a more tight fitting dark navy tee shirt just to see how bad it would be. I’m happy with it and glad I tried it out. Some people add arrowroot powder or cornstarch, I have never and haven’t felt the need to (I don’t keep either in my kitchen usually and didn’t want to buy it just for this). Body odor can be a sign of gut imbalance, I was surprised that when I did the GAPS intro diet, mine went away completely. I have done this without any essential oil, and it worked well too. I couldn't get the "consistency" just right often enough, though, to use in the old deod. container functionally. So that combined with being lazy, I started just rubbing coconut oil directly on to my armpit and then dipping my finger tips into the baking soda and patting a light layer on top…works just as well (really well!) and no mixing or forethought needed :) I just keep a small tub (old yogurt containers) of each in the bathroom and refill as needed, so I have my "bathroom" supply. I also then use the CO for moisturizer as needed after the shower, and the BS for cleaning. Well that totally works! I have a big container of baking soda for various things on the counter in my bathroom right now ;) Useful stuff! How much coconut oil did you use? I have never heard of doing this before! How neat! About 3-4 tablespoons. It is neat, I love it! question for you… you said in your original recipe 1 tbs of coconut oil and now you’re saying 3-4 which one is the best youve tried? It does say 1 TBSP in the directions but I was having a hard time understanding one TBSP making a paste with that much baking soda. 3 TBSP sounds about right. I’d start with 1 – 2 TBSP and keep adding until baking soda is thoroughly combined. Just wondering if you are still using this? I am- I love it! LOVE this idea, but do you know of anything that would work as an antiperspirant also? Antiperspirants work by causing the pores in your arm pit to stop producing sweat. This seems to force the toxins that your body is expelling with the moisture to overload your lymph nodes which are many in that area. There is some thought that this can greatly increase your chances of getting breast cancer. Just a thought. That is actually a myth. There are multiple studies that prove antiperspirants & deodorants do not add to your risk of breast cancer. I just found this website. I found this baking soda and coconut oil combo on another site, tried it and it worked great. The other site suggested adding corn starch as an anti-wetness ingredient, but I haven’t tried that yet. I’m impressed, I need to say. Actually hardly ever do I encounter a blog that’s each educative and entertaining, and let me inform you, you have got hit the nail on the head. Your thought is excellent; the difficulty is something that not enough individuals are talking intelligently about. I’m very completely happy that I stumbled across this in my seek for one thing referring to this. 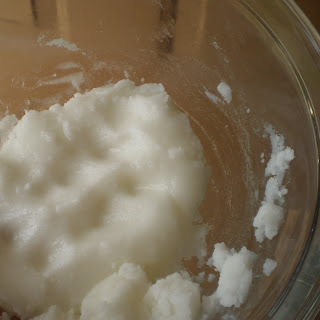 Coconut Oil has a very low melting temperature (melts on contact with skin) I have found that in the summer my coconut oil will stay as a liquid and not solidify again until the heat of the summer dies down. How have to found this deodorant in the summer months? I keep mine in the refrigerator in the summer – when I put it on, the contact with my skin warms the oil enough to apply. Plus, it is delightfully cool! That is such a great idea! My coconut oil is liquid all summer long too! Maybe this sounds weird, but I started using white vinegar on a cotton ball as deodorant. I carry around a very small bottle and some cotton balls in my purse in case I have to re-apply it later in the day — most of the time I don’t need to. I suppose I should use some kind of organic or raw vinegar, but haven’t yet. Of course you can’t use this immediately after shaving though, so do your shaving in the evening! I make this too and it works great! I would not want to put a “cheap coconut oil from walmart” on my skin! What you put on your skin goes into your blood! Put the best on your skin….no matter where it is going! I LOVE this deodorant! it works better than *any* other type I’ve tried (including the conventional, chemical laden verities)! it’s so hot here,my coconut oil sitting on the counter is liquid. i suppose i’d need to put it in the fridge to keep it solid??? sounds interesting and i want to try this! I’m going to put it in a jar rather than a tube, then just put it on with my fingers. I think it would work to keep it in the fridge though! It works really well, if you want you can just try mixing a little in your hand and applying it for the day. Use plenty of baking soda, the only times it didn’t work for me was when there wasn’t enough baking soda. I make something similar with cornstarch added, and it works better than anything I’ve ever bought. I keep it in a jar and apply with my fingers year round. I tried making a batch without the cornstarch, and it paled in comparison. Curious what your cornstarch recipe is! Have you had any problem with the baking soda being irritating to your underarm skin? I like this idea; I use baking soda and apple cider vinegar as the two-step process I use to clean my hair since I went ‘poo free over a year ago. I tried dabbing straight baking soda under my arms but it was too abrasive; wondering if the coconut oil ameliorates that. I haven’t, but plain baking soda doesn’t bother me either- maybe just try a small amount first? That’s good to know. I’ve never tried it with cornstarch since I don’t usually keep that on hand, but baking soda and coconut oil I always have! I found the baking soda a little rough, so on my next batch I am going to put it in the food processor first to make it finer. So, does this stuff work on people who sweat a lot (and stink)? Currently, if I don’t use the stuff with 20% aluminum I stink. Would love to get away from all that aluminum. Try cutting slices of lime or lemon & rub armpits…will get rid of odor. Nothing I have ever tried worked. I don’t know about this recipe exactly, but baking soda and cornstarch alone didn’t cut it. THIS one, actually works for me!! I am sooooooooooooo thrilled! My fingers get all red and irritated when I use baking soda to clean…a little scared to use it on my arm pits…any substitute? I must have A LOT of toxins then. LOL. i make this all the time and i love it!! I do it with cornstarch and baking soda, sometimes with arrowroot powder instead of the cornstarch. Either way i LOVE it. 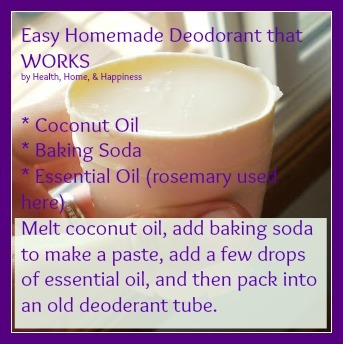 My homemade deodorant is coconut oil, baking soda and arrowroot powder. Hands down best deodorant ever! I too use homemade! Love it! Nothing works better. I use the lavendar and tea tree oil in mine and love it! I used too much tea tree in my first batch though and it burned, so I had to mix another batch of oil and soda and added it to the origional batch and it was perfect again. I first started using this recipe when I lived in PA but the real test came with moving to NC and adjusting to the intense (for me) heat/humidity. One application in the AM is all I’ve ever needed, even now. This is totally new to me who needs industrial strength deodorant (I live in Florida, for one…). Thanks for the recipe. You probably know this but will relate it for others: you can buy coconut oil/or in solid form at health food stores. It’s very good for you and is good on sandwiches (well..banana and peanut butter, for instance). I heard it also is good to assist in wright loss but check it before you eat a whole jar. Mine keeps well in pantry. If u refrigerate it, it of course gets to ohard to use and takes a long time to soften up. I just made a batch and am so excited to see how it will work for me.I’m glad I didn’t throw out my almost empty Tom’s deodorant tube!! For those of you with sensitive skin, just reduce the amount of baking soda. I use 1 tbsp. baking soda to 3 tbsp. coconut oil and it works fine for me. I tried using more baking soda for summer, but it started irritating my underarms, so I went back to the first ratio. I absolutely love it and it’s pennies to make! I found this site because I was looking for a recipe to replace this amazing deodorant I just bought. It has all the same ingredients as the above recipe but it has beeswax too. I am telling you all this because I think it is the solution to the worry about the coconut oil turning to liquid in warm weather. I have not yet made mine, but I plan to add a little bit of beeswax because I live in Florida where my coconut oil is liquid for a large part of the year. They also added vit. E which I think is a nice idea too. 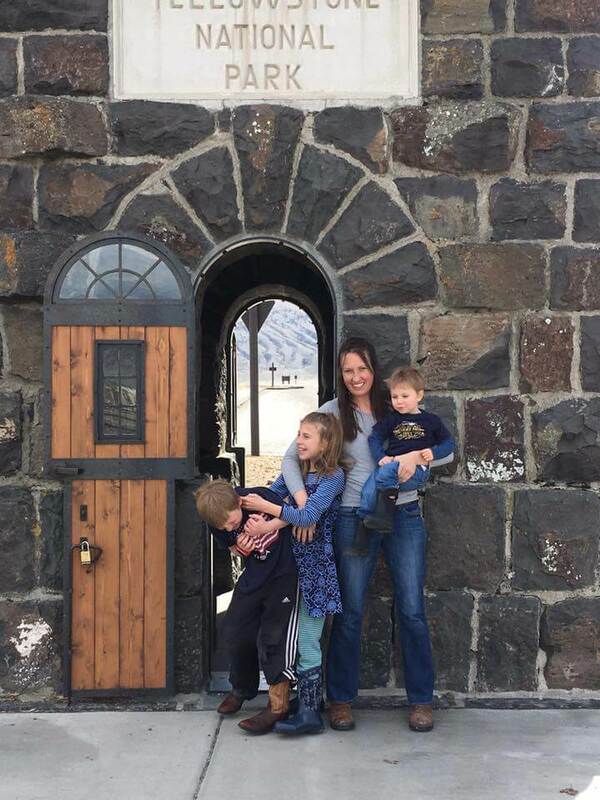 I tried this way back when….before I went soap and detergent free….and the baking soda did cause my armpits to break out. (I did wonder if it was a reaction from the baking soda and any aluminum that may have been left in my skin from recent past use of aluminum deodorants) That said, I have very sensitive skin and have always had skin problems until recently when I stopped using soaps and detergents. I only use baking soda and vinegar (except once in a great while I will use the natural baby soap). Most of my skin problems have disappeared. I no longer have itchy bumpy legs from shaving and my eczema has almost disappeared. I use Toms deodorant now, and it is ok for me, but not great. I am going to try this again and see if my skin is more tolerable to it now. Thanks for the post. Just came across your comment about not having itchy, bumpy legs from shaving by using baking soda and vinegar. Is there a recipe you use for making shaving cream? And, do you make your own kind of soap/detergent? I use a similar recipe. Instead of a tub, I lined a toilet paper tube with plastic wrap and just press the “stick” up when I need more. Since I’m allergic to commercial deodorants, this is a godsend! Love the t p tube idea! Much cheaper than buying special containers. for those that are sensitive to the bakingsoda try the kind without aluminum in it. There is some out there just have to look for it. One that I found is called “Bobs Red Mill”. Maybe you are confusing baking soda with baking powder. The latter may contain aluminum. The former, baking soda, never contains aluminum. As well as using good quality coconut oil you also need to make sur you use good quality essential oils. Essential oils are super concentrated plant products so even though a good quality EO is measured in drops, each drop, for instance peppermint essential oil, can be equivalent to that of 28 cups of peppermint tea. Cheap health food store EOs are full of additives and contaminants. Remember, what you put on your skin goes in your body. If your making your good deodorant I’m sure you care about your body. 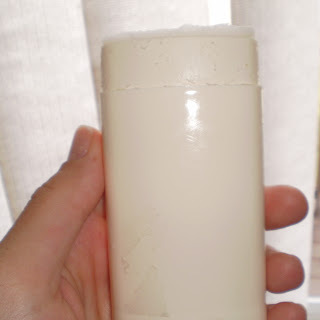 I have been making my own deodorant for about a year now and love it. I use the coconut oil, arrowroot, baking soda (trying to find aluminum free) 10 drops of Young Living Essential Oil Thieves and 10 drops of bergamot. I heat the coconut oil to melt and then put in a deodorant container. I keep mine in a designated area of my refrigerator because it melts so quickly. No BO for over a year and will never go back. Teaching my daughters to go natural. Made my own face foundation from arrowroot powder and cocoa powder. Face looks better be has helped with wrinkles. Oh my! This deodorant is fantastic. As someone who is allergic to the aluminum in commercial anti-persperants, I generally use Tom’s deodorant. It works fine for a while, but it’s not nearly as effective as this recipe. Thanks so much for sharing! Wow, this deodorant is fantastic. It works really well – no stinky underarms and really cheap compared to the expensive health shop versions I’ve tried. If using 3/4 c of baking soda you do need about 4 tbspns of coconut oil. I used tea tree and lavender and its a nice combo. Only criticism is from my husband who is not a huge fan as the soda rubs onto his armpit hair and he said it looks like he has dandruff in his underarms! Also I did notice it left a white mark on my black shirt, but it hasnt marked any of my other shirts and it came out easily in the wash. I found it even lasts two days if you dont shower, you still wont smell! I just made this, which i’ve been meaning to do for the last year. I had to use more than a tablespoon, though, to make it a paste. I just put it in an old Dove stick and can’t wait to try it out in the morning. I used an Orange essential oil with it, which smells amazing enough to eat. You mentioned in your update that people were putting arrowroot powder or corn starch in their products. Is this to help solidify it? How much were others adding? Has anyone tried this with peppermint oil (instead of rosemary)? To keep your deodorant solid, add beeswax. Whole Foods, Amazon, and many health stores have it. I live in the Caribbean where its basically sunshine all year round. Do you think it would work in these humid temperatures. I had lemon and lavender oils so I used 20 drops of each and mixed the concoction in my food processor so it resembled pastry crust, which was the perfect consistency to pack into a used deodorant container that I bought from another earthy lady on etsy. It’s an excellent deodorant and I think the lemon/lavender combination smells great. Can you use a perfume body spray for the scent instead of the essential oil? I just made this a few days ago, and absolutely LOVE IT! I will not go back to store bought. I have tried several store products and by the end of the day, even without working up a sweat, I am getting body odor. Now, even after working in the yard on a hot day , cutting down dead tree branches and working up a sweat, I still smell good. I find myself whiffing my underarm occasionally throughout the day!! I added honeysuckle oil to my deodorant. I also added a little beeswax as recommended to solidify it more. I put it in an old deodorant tube but I don’t know if it was broken, but it wouldn’t come up, so I softened it and put it in a saran wrap lined toilet paper tube and just push it up. Works great. I find I use my fingers to spread it around and brush off any excess b. soda. I know you will love it. I am going through menopause and am always hot and it works wonderfully. Thanks for the recipe. If the baking soda is too rough use a mortar and pestle or really good food processor and grind it down to a finer powder. Also if its too soft, you could always add a little beeswax to it to firm it up a little. 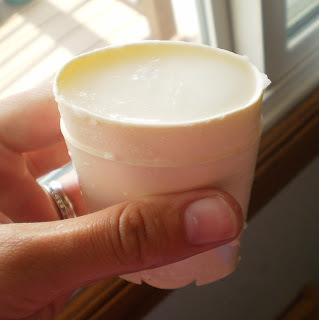 To make the mixture a little firmer to use in an old deodorant container try melting some beeswax into the coconut oil, then add the baking soda and essential oil. It will be much firmer and set quickly so you will have to work fast. Also, i never measure, just remember a little beeswax goes a long way. 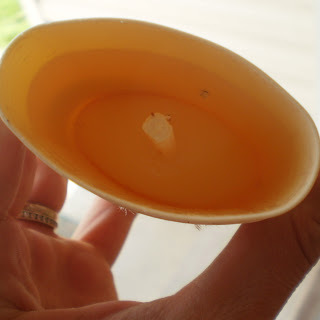 If you need more just melt it back down and add more beeswax.Good luck and thanks for sharing! Mix 1/2 coconut oil with 1/2 baking soda add several drops of lavender oil. Be sure the soda is super fine like the red mill brand . Place in small jar and mix well keep in a cool place . Ladies keep in mind that baking soda has aluminum in it so you are really not avoiding the main toxic element. Buy aluminum free baking soda for this. This Probably works well. If you don’t need a scent because you wear perfume, don’t add any (?). When I run out of deodorant or toothpaste, I use baking soda. So the coconut oil is just for the skin then? Is this the same coconut oil you eat? I just finished making my first batch. It hasn’t hardened up yet, but I’m afraid that it might be gritty? Does that texture change once the coconut oil rehardeneds, or is that what the suggested corn starch is for? I love this deodorant. I made it about a year ago. It worked so well, but the bad part was that I developed an underarm rash. Not sure why. I’ve been using homemade deodorant for quite some time now. I do use arrowroot powder in mine. I love it much better than any store bought! I have kept old containers of my daughters & refilled them & stored in the refrigerator until I’m ready to use. This works so well that if I forget a day to apply I still have no issues with smell! I’ve made this recently and am odor free all day but I have issues with the baking soda leaving white marks on my shirts after sweating and it drying. Any suggestions?? I love this deodorant but it doesn’t love me. After 2 days of use my under arms get red and raw. I think it is the amount of baking soda since baking soda is abrasive. One thing for sure, it works!! !